I can remember, when I was a boy, delivering the Newark Star-Ledger. This was in the mid- to late-1970s. I had a big canvas pouch, filthy with accumulated newsprint ink, and a stout metal ring that held a sheaf of stiff paper cards, one for each customer, on which I could record collected fees. 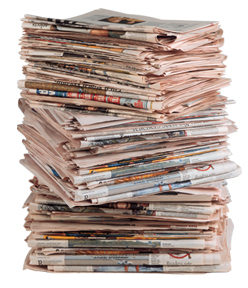 Every morning, a guy in a station wagon would leave a bound stack of newspapers in front of my house. I would cram the newspapers into the canvas bag, get on my bike, and deliver the papers. I’d pedal away from my house at 6am or so—into the cold and dark if it was winter, under a brightening sky and rising sun if it was summer. My paper route was unusual in that it consisted of one long street, a roughly one-mile-long stretch of access road called Dupont Trail. The papers were heavy and the hills were steep, and I got $6 a week plus tips for 7-days-a-week delivery. The Sundays were particularly onerous because delivering the much larger editions required two (and sometimes three) trips out onto the long access road and back. A full week of Star-Ledger delivery cost 90 cents. Sunday-only delivery was 30 cents. Later this price increased to 35 cents, causing some customers to cancel their subscriptions. A pretty good tipper, I remember, might give me $1.15 when I collected fees on Friday afternoons. A quarter tip on a 90-cent bill. Not bad, percentage-wise. It was hard work, but I don’t remember complaining. I’d had to enter my name on a waiting list just to get the route. I delivered those papers from early 1975 until early 1979, when I turned 16 and got a job as a clerk in a Grand Union supermarket in the next town. In all that time, I never missed a day’s delivery, though I still to this day, some thirty years later, once in a great while, have a dream where it’s late afternoon and I’ve completely forgotten to deliver the morning papers. All those empty mailboxes, all that undelivered, unreceived news. This entry was posted in The Vanished Past and tagged New York Times, Newark, newspapers, recession, recycling, Star-Ledger, Washington Post by Harry Ramble. Bookmark the permalink.